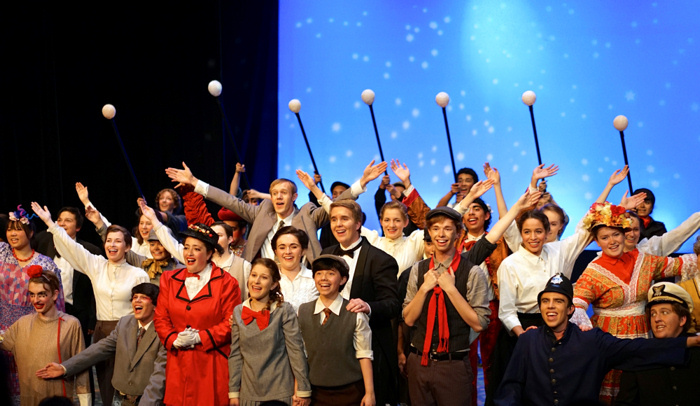 Mary Poppins is one of the most beloved musicals of our time and San Dieguito Academy mounted a remarkable production. Everyone in this musical was a standout and each actor clearly invested in telling the story honestly and with integrity. The show opens with our Bert, played by a spirited Andrew Kenny, who is never without a smile and dynamic stage presence. 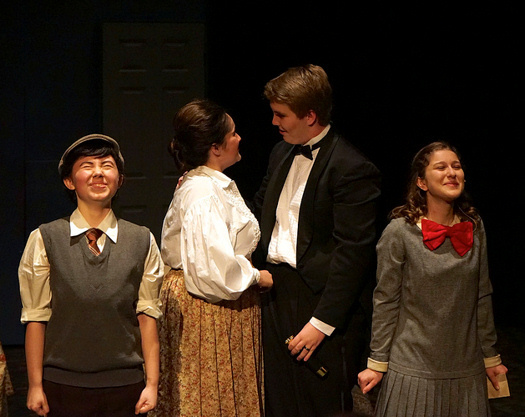 In �Cherry Tree Lane (Part 1� he introduces the audience to the Banks family, George (Dashiell Gregory), Winfred (Delaney Ryan), Jane (Rachel Dovsky), and Michael (Shea Fairbanks Galaudet). Delaney Ryan truly brings substance to Winifred Banks and unlike the movie version Mrs Banks played by Glynis Johns, she shows us a vulnerable and sad side of her, who longs for her own career and a better relationship with her husband, Mr. Banks. Dahshiell Gregory portrays a stoic and often irritable Mr. Banks who seems to have very little time for the �pleasantries� of having a family. There are many stars in this production such as Samantha Steinberg, who plays a terrific Mary Poppins wand has a beautiful voice. She also possesses poise and a natural acting ability. The two characters who completely captured my heart were Jane and Michael Banks. Rachel Dovsky and Shea Fairbanks Galaudet are amazing. 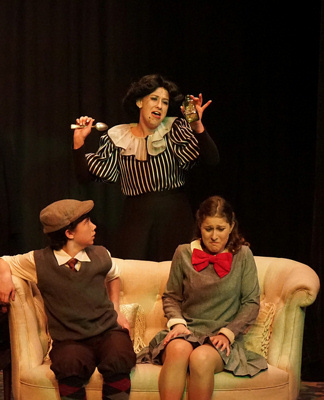 Yes, Michael is played by a girl and from the moment Ms. Galaudet is on stage you see all boy! Michael is a rascal and Ms Galaudet plays it well. 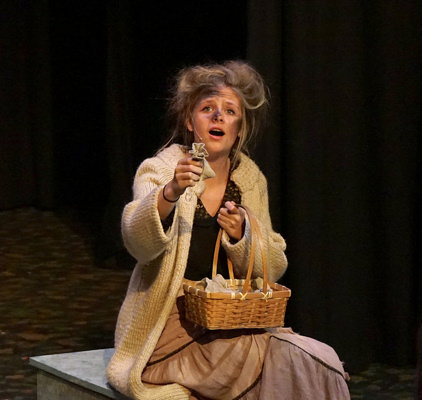 Ms. Dovsky's Jane is quite the know-it-all yet still proves to be loveable. These two actors never crossed the line with their characters by being too mischievous. It was always just enough that you could forgive and fall in love with them as children. Both have wonderful voices and they blended perfectly. It is difficult to take your eyes off of actors this great. All of the musical numbers were executed with tons of energy. 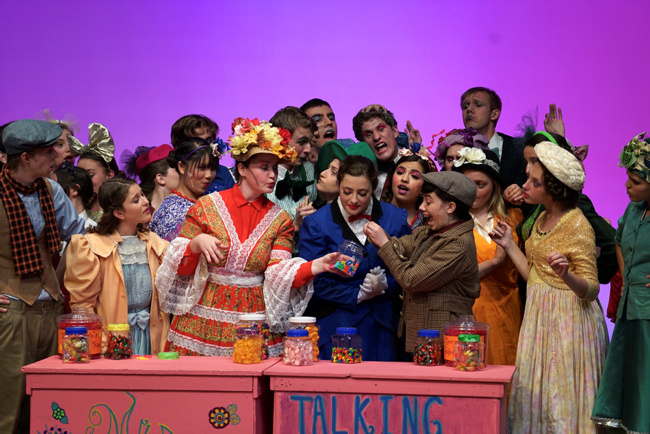 My favorites included an animated �Supercalifragilisticexpialidocious,� with a dynamic Emily Templin as Mrs. Corry. �Practically Perfect,� with Mary Poppins' items being retrieved from her magical bag, mirrors, plants, a hat stand was delightful. I especially liked �Playing the Game,� and �Let's Go Fly a Kite,� but my all time favorite was �Step in Time.� The group tapped relentlessly and with so much vigor and synchronicity that I thought I was watching a professional cast. The only downfall occurred when the individual seated in front of me decided to raise her cell phone to my eye level to take photos of the cast. I nearly missed an entire song. Perhaps in the future I will ask for a front row seat to avoid a potentially obstructed view. I say future because I will definitely be returning to see a future production of San Dieguito Academy. Transitions were smooth, the sets were done well and the orchestra was perfect. This was an incredibly well directed show with a dynamic and group of young artists committed to telling the story. 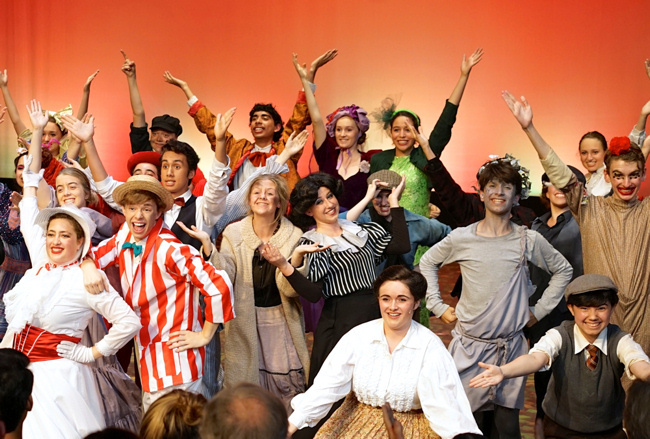 Typically in a production you may find one individual who may be caught not smiling or truly in character but every lead, supporting and ensemble actor gave 100%. Even the following day I could still hear tireless tapping and found myself humming the tunes of Mary Poppins.